They dynamic duo of Kathleen from Nerds Roller Skates and Theresa from Free Spirit Dance, have teamed up to keep roller skating staying alive for all Calgarians! They believe roller skating is an incredibly fun, affordable and healthy activity that should be accessible to everyone. Their goal is to keep roller skating staying alive for generations to come through SUNDAY SKATE, roller skating events and more! Join them for a roll at SUNDAY SKATE and say hi! Kathleen “Roxy Acetylene” got her start in roller skating as a kid when the rink was up the street from her elementary school. Always more fond of arts and dance than sports, she earned a BFA in Jewellery and Metalsmithing from the Alberta College of Art & Design. She discovered the world of Roller Derby in 2006, when she met a group of women starting up Calgary’s first roller derby league and dusted off the vintage skates in her parent’s garage to challenge herself to play the rejuvenated sport. As a founding member of both Calgary Roller Derby Association and Chinook City Roller Derby, she contributed to the community as a player and organizer for 9 years with events such as Calgary’s first Roller Derby entry in the Calgary Pride Parade, and the still legendary Heroes vs Zombies bout at the Calgary Comic and Entertainment Expo. 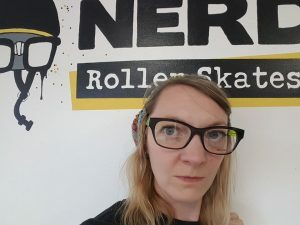 She co-founded Nerd Roller Skates, Calgary’s specialist quad roller skate shop in 2012 and works there today fitting skates to skaters and sharing the love of all types of roller skating with the public. Theresa is the owner of Free Spirit Dance. 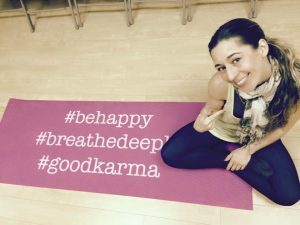 She is a dancer, instructor and choreographer. She started dancing from the first time her mother put her on a pair of roller skates when she was two. She has many a memory of spending countless hours in her room creating dance routines inspired by Solid Gold Dancers, MuchMusic and In Living Color; and learning moves at the Friday night community hall teen dances back in the day. The funk, groove and need to move have long been a family tradition as she comes from a bunch of crazy-musical-fun-loving East Coasters. Theresa took her first actual dance class in her early 20’s and she has never looked back. Theresa recently reconnected with her first love, roller skating, simply for the joy of it and can’t wait to make it accessible to more Calgarians. She has trained in various dance styles such Salsa, Cha Cha Cha and Afro-Cuban, West African, ballroom, jazz, contemporary, hip hop, funk styles and house. She has traveled to Cuba, Costa Rica, Croatia, Los Angeles, Mexico, Miami, New York, Boston and across Canada to pursue her love of dance. She has performed with Latin artists such as Puerto Rican Power, Oscar de Leon, Mendez and Eddy K. Theresa has presented her own choreographic work for Mpact: Invisible, The Cypher and Motion, and Free Spirit Dance. Live life outside of your comfort zone, because that is where the magic happens! Live. Love. Dance. SKATE.